So this is the result of my 24 hour crazy jacket project – a ski jacket in soft shell fabric, inspired by this Hafjell Ski Jacket . It will be an entry in Pattern Review’s Bargainista Fashionista competition where you interpret a high end garment and also submit the price tag difference as part of the competition. The sleeves has cuffs with thumb holes. For instructions, see my video tutorial. For the hoodie I used elastic cord and stoppers. I’ve done a tutorial on how to add these. The pockets are placed in the princess seams and has mesh lining. The fabrics I used are two soft shell fabrics. A grey/navy heathered one and a solid navy for the inserts and the hood. I love my new jacket! And considering the circumstances around the making, I’m surprised it turned out so well. 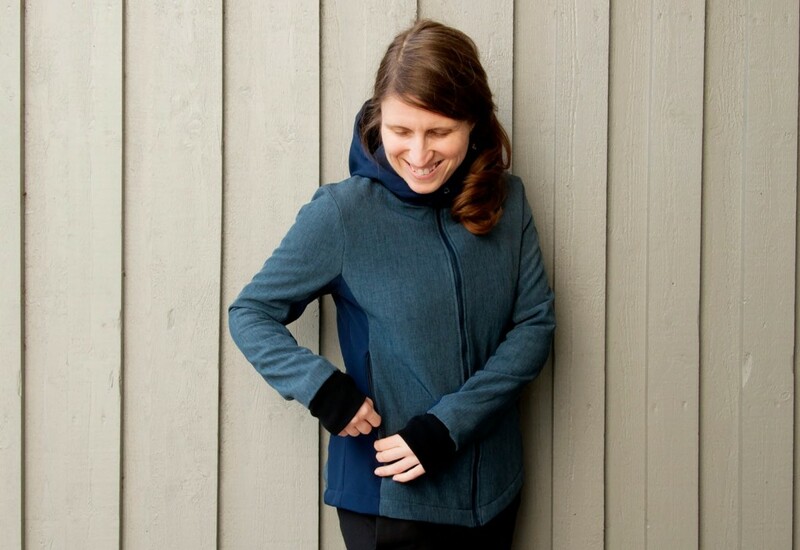 And now some thoughts about trying to make a jacket from scratch in one day. I had already done one pattern draft and a muslin, so I kinda knew what needed to be changed and had also written down a lot of measurements before I began the drafting process on Saturday. So that prep work made the pattern drafting process much quicker than usual. But due to time constraints I only pinned the paper pattern pieces together for a final fitting. What I hadn’t anticipated however is that soft shell fabric has some quirks, for instance it can’t handle ease in the sleeves, so I got some horrible puckers at the cap which was impossible to remove. And since the sleeves had two seams with inserts that corresponded with the bodice side pieces, I couldn’t just recut the sleeves. After some major distress I decided to use a pattern which has no sleeve ease and reshape the armscye and the sleeve cap using that pattern as a guide. It worked better than expected, but of course a properly drafted sleeved would have yielded a nicer result. Also in hindsight I should have made the fit around the hips a bit tighter. I hate it when jacket hugs the hips and in an attempt to avoid that I went a bit too far in the other direction. I will add som cording to compensate for the issue, so no biggie. I felt more stress than usual which took its toll. Also I didn’t have the same control over the sewing process, it was all go, go, go! On the other hand, I felt an incredibly flow during the day. Like I had gained some kind of sewing super powers. And even though I didn’t reach my goal of finishing the jacket in one day, I could see how much I actually had accomplished in very little time and when I went to bed I knew I would be able to finish the rest fairly easily, since the worst parts were done. But won’t do a project like this again in quite a while, because it put everything else on hold for over a day and a half. For instance I normally do some kind of exercise almost every day, but that went out the window this weekend. I did manage to cook dinner on Saturday and enjoy that with my husband and a glass of wine, but that was about it. I’m glad I did that for two reasons. Firstly since everything was a blur of stress and focus, I have very little recollection of what exactly went down this weekend. But because of the video blog, I’m able to see what went on. And secondly I find it hard to capture the raw emotions of sewing struggles in a written blog post, because when the photos are taken of a finished garment it somehow looks “easy” even though there were some real drama going on behind the scenes. My video of the madness. When I say that I finished the jacket in two days, I’m not entirely truthful, as I also plan to seal the seams to make the jacket more water resistant. But I won’t rush into that, instead I will do diligent research and testing. I’m in no hurry though because spring just arrived here in Sweden! Hej Johanna, videon verkade jättestressigt, jag är glad att jackan blev saaa lyckad! Du är verkligen kul och duktig!